Rigongpa Chökyi Sherab was born to a family in Yöl. Much like Mokchokpa and Kyergangpa before him, he was named after the locality where he spent many years meditating and teaching, Rigong. He was naturally inclined to the dharma and sought at an early age to devote his life to benefiting others. He met his master and stayed with him in Kyergang. 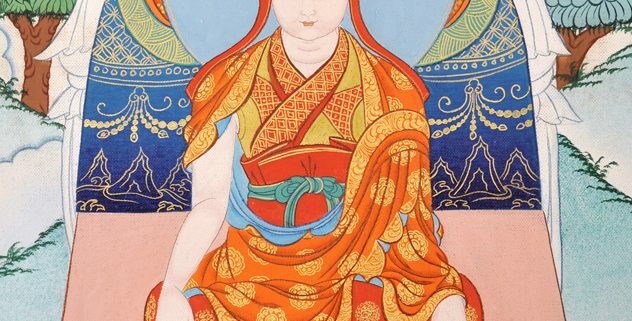 Lama Kyergangpa transmitted all of the secret instructions to Rigongpa, leaving nothing out. Lama Kyergangpa told Rigongpa about his past and future lives and advised Rigongpa to lead the life of a secret yogin, drinking beer, eating food offerings, wearing old rags and enjoying mixed company, which also earned him another name, that of Bepé Naljor (sbas pa’i rnal ‘jor) or “Hidden Yogin”. (However, we don’t know for sure whether or not he actually followed that particular piece of advice. While it says at least in one western publication that Rigongpa was a layman, there is no clear evidence for that assumption. We rather read in his autobiography how he decided to renounce the world already at the early age of eleven, how he took novice ordination at seventeen and full ordination at age twenty. Now, that was presumably all before he met with Kyergangpa. Nevertheless, in paintings he is always depicted as wearing the monastic robes of a fully ordained monk.) 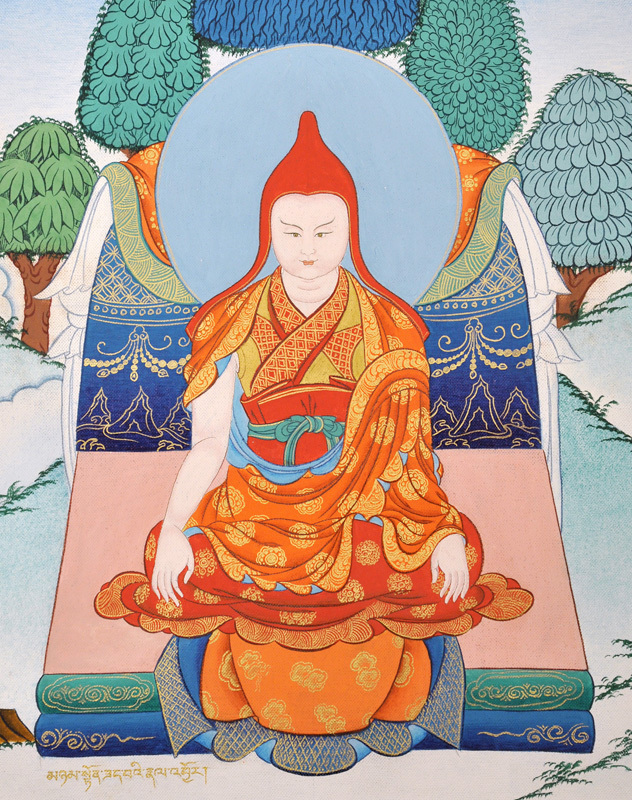 Kyergangpa told Rigongpa that he would establish connections with many students and would have ten fully realized disciples who would hold his transmission and the lineage of the Shangpa lamas. Rigongpa had visions of many dakas and dakinis, especially of Sukhasiddhi, from whom he received the four complete empowerments and the main points of secret practices. Rigongpa could see many deities face-to-face, including the Six-armed Mahakala, the special protector of the Shangpa Lineage. He had a particularly close relationship with the protector and was famous for having constructed a statue of the same. Actually it was an emanation of the protector, appearing as a yogic practitioner, who constructed and consecrated the statue, by way of finally dissolving into it, with Rigongpa in close attendance. Particularly the close attendants of the protector apparently were extremely eager to please Rigongpa. So much so that he had to admonish them repeatedly in the strongest terms not to harm those whom they considered his enemies. Once, when seeing Palden Lhamo in a vision, he argued with her and insisted that she and the other attendants of the protector cease to harm human beings. It was her who then insisted that a statue of Six-armed Mahakala ought to be made. Thus the statue, and presumably a temple to house it, came to be constructed. In later centuries many great masters, including the previous Kalu Rinpoche, traveled to the Rigong area and remarked about the extraordinary blessings which both the statue and the locality still retained even then. In his later years Rigongpa traveled to various buddha realms in his dreams and was granted many empowerments and teachings. Once a dakini appeared to him, of which Rigongpa asked her name. She replied “I am Sukhasiddhi which means Bliss-Accomplishment, bliss because my mind if filled with stainless wisdom; accomplishment because one can accomplish the extraordinary siddhis within a year or month by praying to me.” The dakini proceeded to grant the four complete empowerments, the main points of practice and the supreme points on realizing the non-duality of bliss and emptiness. Then Sukhasiddhi told Rigongpa, “Yogin, since your body, speech and mind are liberated, those who receive empowerments from you will never again fall into the three lower realms.” Despite this prophecy, Rigongpa seems to have been somewhat disillusioned with at least some of his students. Towards the end of his life he is reported to have said, “In these degenerate times, most of those who hear the dharma do not understand it. So it is better to just be quiet.” He benefited many disciples, establishing them on the path to freedom and lived more than seventy years. Sangyé Nyentön is the sixth of the Initial Seven Jewels of the Shangpa Kagyü.